Karndean Design Flooring is a brand of luxury vinyl flooring. It is made up of five layers this consists of two PVC backing layers, one high definition photographic layer, one clear PVC embossed wear layer and a top polyurethane (PU) protective coating. Engineered wood flooring is precision-made of layered sections of solid wood bonded together. The top layer of the board know as the lamella, is usually hardwood and can be anything from 2-6mm thick, the thicker of the surface layers are equal to those on a solid board. It’s helpful to start off by understanding which floors should be avoided. The floor types you should never install in the bathroom or other high moisture areas include engineered and solid wood. Better options would include some laminates, luxury vinyl tiles and click vinyl. A standard installation cost for laminate flooring can vary from £8 to £12 per meter squared. Some fitters prefer to offer the customer a day rate this can again vary between £150 and £200 per day. The floor you choose for the kitchen, above all else, has to be exceptionally durable. As it is one of the most-used rooms in the home, it’s not just general foot traffic wear and tear you need to be aware of. The kitchen has the highest risk of spills, stains, dents and scratches. So durability and practicality need to be your main concerns. Luxury vinyl flooring is one of the most practical choses for the kitchen as it portrays products like wood & stones, but without any of the upkeep. Amtico Flooring is a brand of luxury vinyl flooring. The product is made from a resin, which is compounded with various high quality plasticizers and mixed with stabilizers. 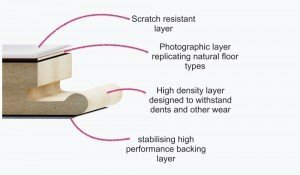 This produces flooring that is extremely durable and best of all Amtico is all made here in the UK. Underfloor heating can be used with a majority of floor coverings including wood, carpet, laminate, vinyl and rugs. However the heat-up time will depend on the thermal conductivity of the flooring material you choose. We would always recommend consulting the underfloor heating installers and flooring manufactures. Underlay is a requirement when fitting laminate, but which one? Underlays can have various technical characteristics, which may or may not be needed for the different rooms around your house. There is really an answer for the best underlay, but there is an answer for the best underlay for your requirements. Most of the time, all you need to keep your laminate flooring well maintained is a light sweep or vacuum, or a damp cloth when a slightly deeper clean is required.